Rush have a new song, but they're not saying what it's called. Pretty sneaky, huh? Rush were never known as a singles band, but the group plans to, er, 'rush'-release a new, limited-edition (and at the moment, unnamed) single from their upcoming album. Currently, the Canadian superstars are in Nashville (Nashville?!) finishing their 20th disc, under the watchful eye (and ears) of producer Nick Raskulinecz, who helmed their last studio effort, 2007's Snakes And Arrows (he's also worked with Foo Fighters). It's just the beginning of what promises to be a busy time for the veteran band. Last week, guitarist Alex Lifeson said on Rush's website, "We were off for a year and a half, and now it's just pouring. Everything is totally crazy and there's not a minute left in the day." 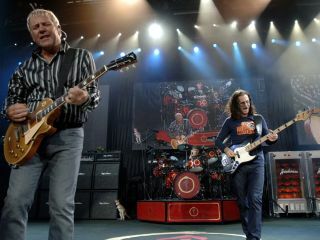 And not a minute to spare when it comes to finishing the new album: Rush recently announced this summer's Time Machine Tour, which starts 29 June 29 in Albuquerque, New Mexico and is set to run - at this point, anyway - until 2 October in West Palm Beach, Florida. The tour will include the band's first-ever performance of their 1981 album Moving Pictures in its entirety. And if that weren't enough, the band's new documentary, Beyond The Lighted Stage, is set to unspool at New York's Tribeca Film Festival on 24 April.